A wonderful sensory experience with all the colors, aromas, and tastes, a review of vegetables, and a yummy soup - we loved our quality time together... and a point checked off our Fall Bucket List. Here are some of our favorite fall activities: Fall Bucket List. one last vegetable she wanted to put into the cart. When back at home, we explored the textures and named all the vegetables again. Parsley and zucchini were tricky for us. The vegetables we ended up with: potatoes, carrots, onion, corn, peas, beans, green beans, cauliflower, spaghetti squash, celery, parsley, sweet pepper, zucchini. We also reviewed some safety rules before starting cooking: washing hands and vegetables, the rules with the knife, care with the hot items. I made meat balls and started our bouillon. While fragrances from the simmering bouillon filled the kitchen, we began cutting our vegetables. My Firefly worked with the butter knife. She was able to cut zucchini easily and green beans with some effort. She explored the textures and hardness of different veggies; and I pointed out the sources of the smells in the kitchen. So much fun! My favorite is my picky eater enjoyed eating her vegetable soup. She was so proud to share her soup with all the family! Her first experience with the knife was good. But yes, all children are different and accidents happen. As usual, please consider safety first when choosing activities for your child. I also allowed her to stir the soup a couple of times with my assistance. Our vegetable fun was great! 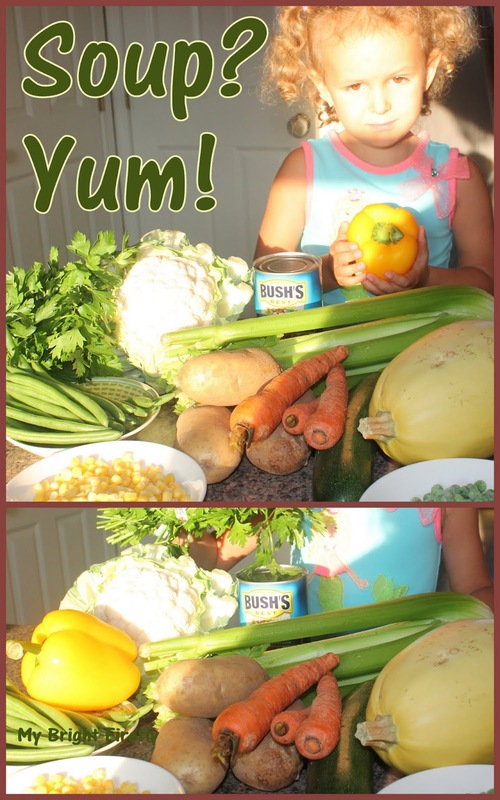 What is your favorite meal for cooking with kids?